By John Sharp: A planning map for the entire city of Mobile, a first for South Alabama's largest city in years, will go before the Mobile City Council Tuesday for consideration. 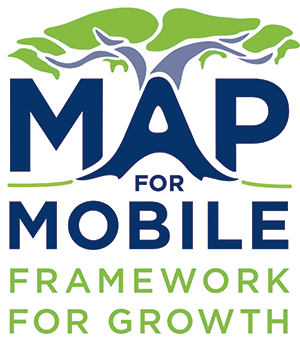 "I want to thank the Mobile Planning Commission for adopting Map for Mobile as a framework that can be used to guide decisions in the years to come," said Mobile Mayor Sandy Stimpson said in a statement. The plan was a top priority for Stimpson, who was elected mayor a little more than two years ago. "We will be working together to implement this plan and use it as a 'living document' with action plans developed and reviewed on an annual basis," he added. The plan, referred to as the "Map for Mobile," outlines methods and approaches the city will follow starting in 2016 to implement zoning, land use, code and ordinance changes and capital improvement priorities. "Our intent is, little by little, to use input from the citizens to drive decisions we make in the future," said Dianne Irby, the city's executive director of Planning & Development. "We want to make sure it's something that can be implemented and reviewed on a regular basis." The city is encouraging the public to review the draft plan online at www.mapformobile.org. Nearly 2,000 citizens participate in the actual planning process during workshops held throughout the city. The city spent $150,000 on the process that was headed up by Goodwyn, Mills & Cawood, Inc., a privately-held engineering and architecture firm in Mobile. The plan includes many elements scattered throughout the city with the main themes focusing on physical design of the city, cleaner and greener neighborhoods, transportation flow improvements, historic preservation and more walkability. Added Debbie Foster with The Peninsula of Mobile: "We are abundant of natural resources, yet we can't walk around." Wanda Cochran, a Mobile attorney and city attorney of Orange Beach, said the plan's implementation will fall on the shoulders of the planning commission, which she encouraged showcasing it during its regular meetings. She also urged commissioners to consider the elements of the plan instead of the outcome of individual zoning cases. "I urge you to keep this map projected in every meeting and be focused on the plan and not the transaction at hand," she said.